Your guide to 11 mile, information you need on Colorado cabins, lodging, fees, fishing, species, regulations, directions, state parks, and maps for fishing at eleven mile reservoir. Eleven Mile reservoir is located about an hour and fifteen minutes west of Colorado Springs and about two hours and fifteen minutes from Denver. This fishery is truly home to some of the biggest rainbow trout, brown trout, kokanee salmon, carp, and northern pike in the state and western U.S. for that matter! This reservoir is also home to a small population of small mouth bass and yellow perch. Safe ice usually forms during the month of December depending on the day and night time temperatures. This lake has a love/hate relationship with most anglers as the fish can be very tempermental, but most days you do have the chance to catch the fish of a lifetime! 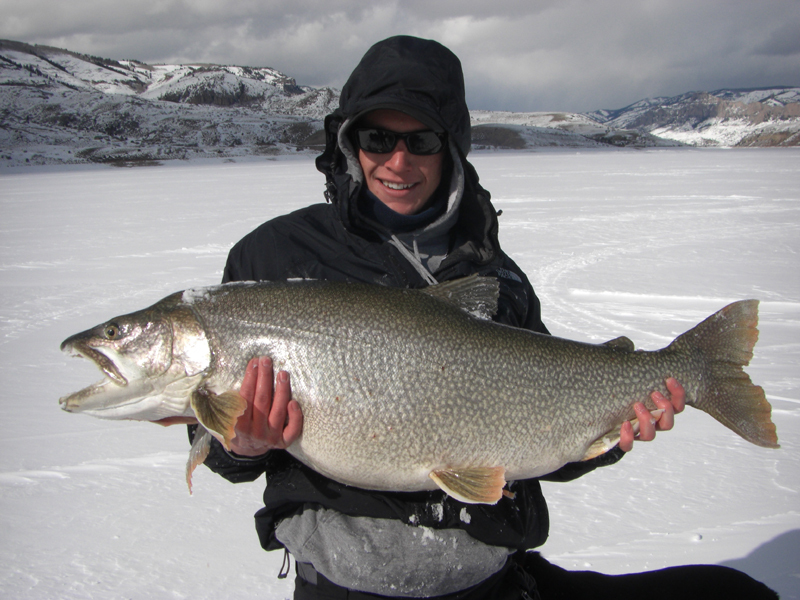 We typically catch 4-12 trout a day, but they can run anywhere from 12-24″+ with the average fish around 18″ and fat! Northern pike trips vary depending on the day and the month, but we are typically aiming to land a fish over 10 lbs in a 6 hour trip. Currently, the kokanee salmon population is drastically down due to gill lice. There are still opportunities to ice fish for them, but the bite is anything but consistent. Good fishing can be had all across the lake. The west end of the is fairly shallow and weedy in areas while the east of the end is deeper with more rock outcroppings. Both ends of the lake hold good numbers and size fish, however they move a lot and it is important to keep drilling holes until you find an area that is holding fish. Eleven Mile is a Colorado State Park and does require a daily or annual parks pass to enter. (For more info or to purchase your pass click here) for more info).